Developers of war-based shooters always try to simulate the very essence of military combat to the best of their ability. From the sound direction - the pang of every bullet fired - to the weight and balance of each weapon in your virtual hands, there s a constant striving for authenticity. In their quest to capture war on a broad scale, many games can t focus too much on a particular weapon or tactical role. 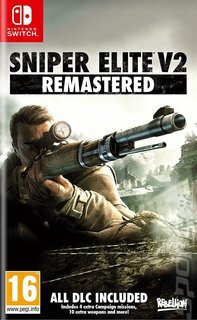 This is where Sniper Elite V2 comes in, now remastered with polished up visuals and new features for the current generation of consoles. A clue to the game s unique selling point is in the name - the focus is on pure, unadulterated sniping simulation. The silent predator of the battlefield finally gets a gaming spotlight in Sniper Elite V2, and a lot of effort has been made by Rebellion to deliver an experience that really immerses you in the life of a ground-crawling, one-hit-counts professional. Set in the dying days of World War Two, you must navigate authentic locations in Berlin and take advantage of weapons such as the Springfield M1903, the Gewehr 43 and Mosin-Nagant 1891/30. You ll be faced with missions focusing on single targets that have more than one possible way of being eliminated - the choice being to line up a perfect shot that leaves you exposed, or taking a challenging route that will allow you to accomplish your objectives undetected. Gravity, wind, velocity, bullet penetration, aim stability... these are all things to take into account when lining up your shot, and are simulated effectively in Sniper Elite V2. With four gameplay modes and online capabilities, this is more than just a quick-fire gameplay session.